Anyway, enough daydreaming. Brooklyn and I have been busy in the kitchen, ourselves. In the last two weeks, we have made two loaves of whole-wheat bread, pizza dough, and a carrot cake. I won't include all of the recipes in this one post, but I will put them up here eventually. 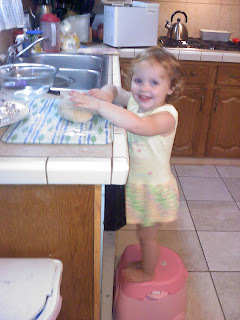 I guess you'll just have to keep checking in... ;) I managed to get a picture of Brooklyn kneading the dough. Too cute! I hope you enjoy this as much as we did. I felt a lot better about eating bread knowing exactly what was in it. Except for the time put in, it seemed a lot more economical, too. Combine all ingredients in a bowl and stir until incorporated. Turn out onto a floured surface and knead until well-mixed (about 10 minutes). Place in bowl and cover. Allow to rise until doubled. Punch down and knead for a few minutes. Place in greased bread pan, cover, and allow to double again. Cool in pan on wire rack for 10-15 min. Allow to cool completely before slicing. * I actually made the dough in my bread maker, on the dough setting. Just put all ingredients in bread maker as listed. The bread maker allows the bread to rise once, so just take it out when it's done, knead a little, and allow to rise again in bread pan. Also, if you would like to make this recipe a little more "whole wheat," you can use 1 Cup of AP Flour, and 2 Cup of WW Flour. I did this the second time I made bread. It still tasted good, but I liked how half and half turned out better.